If your thought is that your own website should be prioritized over Facebook, I would wholeheartedly agree with you. Your website should be the central hub of all of your online marketing activities. If you’re thinking that Facebook is more of a community-building tool than a sales engine, I would also agree with you there. That’s social media 101! But if you’re thinking that you should stop using Facebook because they require you to “pay to play”, that’s a whole other thing. Here are some thoughts on why you shouldn’t give up on Facebook… yet. According to Search Engine Journal, social media makes up for nearly a third of all referral traffic, and Facebook represents a significant portion of that. This isn’t to suggest that Facebook is a magic bullet; it’s not. You have to put a lot of time and effort into building an engaged community, and that doesn’t happen overnight. It doesn’t necessarily need to be a large following, but it helps if your community – large or small – is interactive. Now, it should be noted that traffic for the sake of traffic does absolutely nothing for your music career, so you have to know what to do with that traffic. When your community cares about you and your music, you can drive sales, encourage more people to come to events, ask them to vote for you when you enter a song contest, and ask them to join your email list. It really depends on what your goals are, but in general most artists would agree that more concertgoers, more sales, more voters, and more email subscribers would be a good thing. Ultimately, this isn’t so much about increasing your Facebook ‘likes’ as it is an exercise in cross-promotion. You can have your website promote your Facebook page, which you could have promote your email list, an on the cycle goes. You’d be surprised by how well this strategy works. I’ve now had the chance to run several ad campaigns on Facebook, and I must say that they have proven to be quite effective. I have several friends that I’m sure would agree. With Facebook ads, targeting specific demographics has never been easier. Not only can you choose what gender(s), age range and location to target, you can also go after those who have liked certain pages, be it Van Halen’s or Metallica’s. And I’m still just scratching the surface of the possibilities here. Another great thing about Facebook ads is that they allow you to control your budget. The daily minimum is $1, but there are no maximums. Most forms of advertising tend to cost a lot of money, but when it comes to Facebook (and even YouTube or Google), you don’t have to spend a ton of money to be seen. You can go check out my first ever Facebook advertising experiment and see what the results were, but I think what you’ll find is that you aren’t paying for the kind of engagement you used to be able to get for free. You’re paying for a lot more than that! Did Facebook do us a disservice, or did they actually do us a favor by creating a platform that allows for highly targeted, highly customizable ads that can be deployed with minimum cost to the user? I’ll let you be the judge of that. You can’t always pick and choose your marketing tools based on what’s convenient for you. You have to be thinking about the people that want to engage and interact with you. When is the last time you’ve seen a major artist without a Facebook account? Not too often, right? This is because both artists and labels know that music fans hang out on Facebook. It’s the most ubiquitous social platform there is, which means that there aren’t any better opportunities available to you… as far as social media is concerned. If you’re an independent artist and want to stay that way, then there is never any need to be a slave to the trends. However, if you have major label ambitions, then I have to tell you right now; you’re probably not going to score a contract without a sizeable and engaged Facebook community. Labels don’t want to take chances on artists that aren’t proven, and one of the ways in which they are “proven” is by the size of their social following. Unfair or not, it’s a reality. When you have a strong following, you have people that are ready and willing to purchase everything you put out. If not, you have to go and find those people, and labels aren’t going to do that work for you. So, it all depends on what you’re trying to accomplish, but a solid Facebook following can really help with credibility and legitimacy. Buying ‘likes’ won’t do much for you though; just so you know. Maybe Facebook really doesn’t fit in with your overall marketing plan, and I can totally appreciate that. But I wouldn’t suggest quitting Facebook because of the algorithmic updates. Google continues to release their updates too, and you don’t see people quitting SEO outright, do you? Every platform is subject to change, and you don’t have any control over that. You only have control over your own web properties, and they should be your highest priority. But this doesn’t make off-site marketing null and void. In fact, when you’re trying to grow your audience, off-site activity tends to be a lot more important than on-site marketing, be it guest posting or social media campaigns. You can’t expect the audience to come to you; you have to go to where they are. Facebook is just a tool, like any other. It isn’t better or worse than much of what is already available to you. It really just depends on how you use it. What do you think? 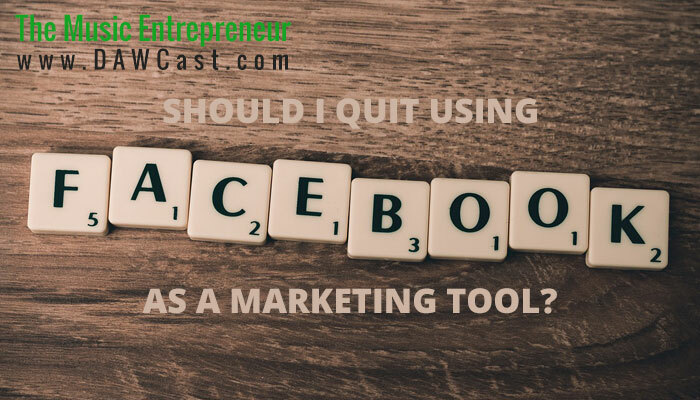 Is Facebook a part of your marketing strategy? Do you think it’s worth it?